The iX500 is designed to close when not in use—the sheet feeder folds down, the output tray folds up, and the whole thing becomes a relatively compact blob. My scanner is located just left of my iMac, and I keep it closed until I have something to scan. Here’s how it looks when not in use (iPod touch for scale—sorry, I was out of bananas). When fully opened, the output tray covers about half my desk, leaving plenty of room for whatever might be in front of it. While made of plastic, as you’d expect, the iX500 feels substantial, not cheap. I have opened and closed the top and bottom hinges hundreds of times, and they show no sign of wear, working as well now as they did when new. The sheet feeder, too, continues to function without a hitch. So while it’s an expensive machine, it feels like the money has gone to good use in designing something that’s going to last. 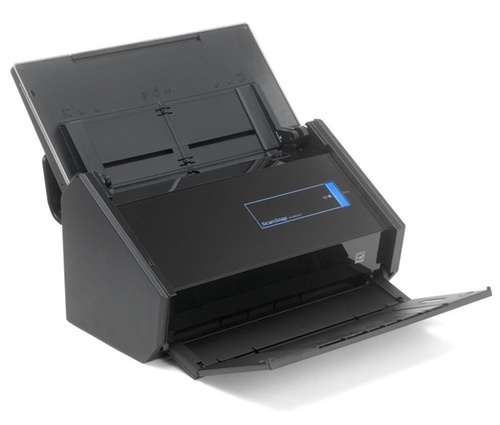 The iX500 is rated at 25 pages per minute for color scanning. I have no idea what speed I’m getting from the thing, but it’s amazingly fast. Stack up to 50 sheets in the document feeder, hit the Scan button, and your source sheets will come flying through quicker than you’d expect. I have the scanner set to do OCR on the pages it scans, and even that is speedy, taking only a few seconds on my iMac for large text-intensive documents. But it’s not just the speed of the scanning that saves time. It’s the getting started speed, too. Although the scanner includes document guides that you can narrow (for scanning receipts), I’ve found the machine works fine without touching them: I scan all widths of receipts without ever adjusting the guides. Just put the receipt in the scanner and hit Scan; I’ve not had one fail yet, even if they’re quite crooked (the software does a great job at straightening them). Fast scanning, fast OCR, and no time wasted during setup make scanning a large stack of paper about as painless as it can be. The iX500 will do double-sided scanning. It has a special app for receipts, if you want to use it (I don’t). 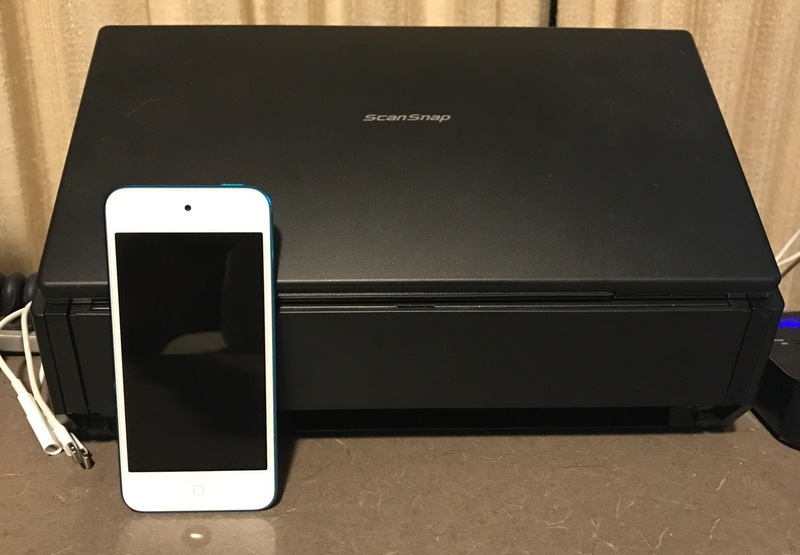 You can scan wirelessly, you can scan to the cloud … there are all sorts of scanning options. You can use a pop-up menu to scan (as seen at right), or you can just have the software launch when you hit the Scan button (which is how I use it). The settings portion of the ScanSnap software won’t win any beauty contests, but there’s lots of control over your scans. Define a format for save file names. 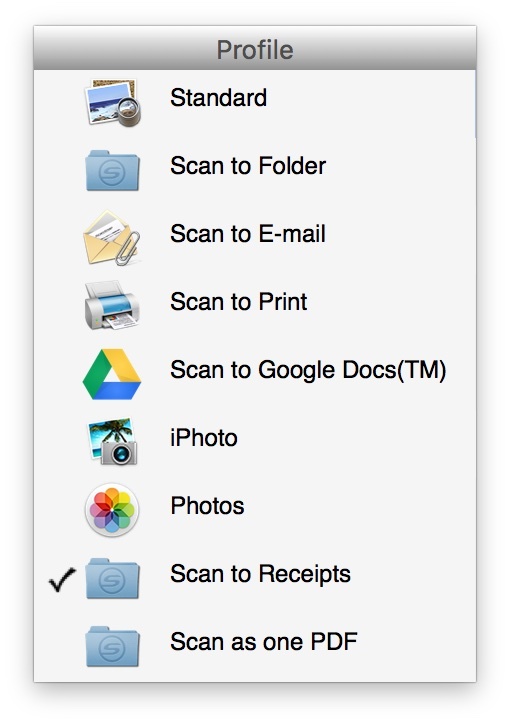 Set the default location for scans. Specify image quality, color mode, rotation, and more. (However, these all have “automatic” settings, which is where I’d suggest leaving them.) You can even set the level of compression you’d like applied to your scans. Once everything is set up, scanning a day’s receipts is usually a few-seconds-long process. I flip open the scanner, drop a receipt into the machine, hit the Scan button, then rename the file when the scan is done (if necessary—I’ll have more on the renaming bit in a future writeup). Repeat until the stack of receipts is gone. I’ll admit I was skeptical when I started this project. Skeptical about spending so much money on a scanner, skeptical about how well it would work, skeptical about the benefits. But now, 15 months in, I can’t imagine not doing this. Our stack of paper has basically vanished, and all our papers exist in text-searchable electronic form (and are backed up in a number of ways, of course). If you’ve been thinking about scanning a bunch of paper, I can’t recommend the Fujitsu ScanSnap iX500 enough—it really is an amazing machine. Thanks for the review. I’ve heard good things about the ScanSnaps, this is a reassuring affirmation. Is the OCR bundled into the SnapScan app? And how’s the quality? The hunt for good OCR is a perennial search of mine, most of my experiences have been underwhelming. I also wanted to make a recommendation for Expensify. It turned my receipt system from a pile of files into a searchable database that’s reconciled with my bank feed. Their OCR isn’t perfect, but it’s good enough to match 90% of scans to the feed automatically. It might dovetail nicely with your paperless lifestyle. To be honest, I’m probably the wrong one to ask about the OCR. It seems fine to me, based on the searches I’ve done for words that I know are in my scanned documents. However, I don’t use it heavily, nor do I rely on it to be accurate. (If I ever need any of these things again, I’ll just print them for whatever need, or forward the PDF, so the OCR isn’t critical. Looks like Liam, though, uses and relies on the OCR and is happy with it. The OCR is via a bundled third-party app, ABBYY FineReader for ScanSnap. Expensify: Thanks for the pointer, I’ll take a look. Thanks again, Rob. I’ll have to give ABBYY a shot. And thank you for the info, Liam. It’s very helpful. I just recently bought one of these to replace using the scan-to-computer mis-feature of my Officejet Pro (mis-feature as it mostly just doesn’t work). I scan everything in color, double-sided, auto throw away blank pages, deskew-ing and OCR. I had to turn up the scan quality so the OCR was accurate for Hazel to be able to find what it needs to auto-rename and re-file the scans. It’s fabulous now – as you say immediately scan a document, it shows up and gets renamed. Wonderful. Chad, be aware that the newer one comes with Nuance OCR software, the older one has ABBY (which is what I have as well). I wonder if that’s why the older one is selling for more on Amazon – more expensive bundle? More desired bundle? More marketable(aka more familiar) bundle perhaps? Some of the older bundles come with Acrobat for PC which would push the price up too. I got mine for $300 off Amazon as a ‘refurbished’ – but had to do a lot of looking and waiting for it to show at that price on either eBay or Amazon. Do you know if the ix500 is compatible with OS Mojave. I just updated to OS Mojave and I cannot get the ix500 to work with the ScanSnap Manager. If you’re using Mojave, you’ll have to use their new ScanSnap Home software. I tested it in a virtual machine in Mojave, and it worked OK, though it’s much different than what you’re used to.